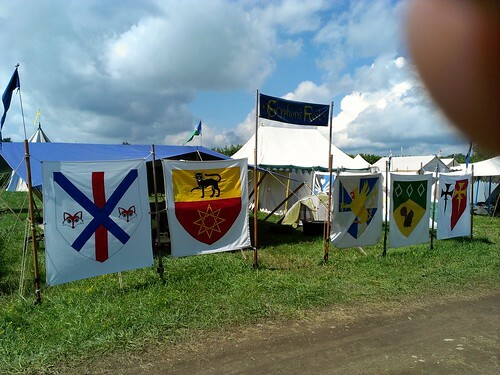 Another spectacular Pennsic is behind us. Things were different this year, the most significant being the dates. We were moved up one week and required to leave early due to another event that followed. I was not happy with the change, but we still enjoyed the time we had there. Overall the weather was great! 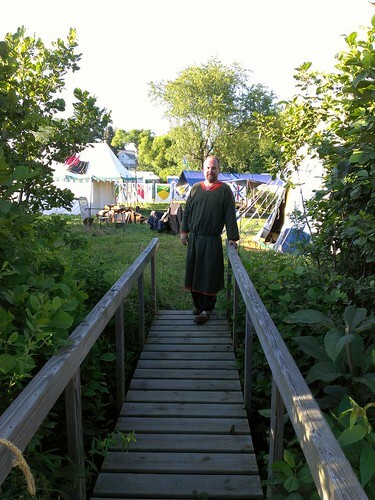 During the day it was cool enough that I didn’t have sweat running down the backs of my legs and at night I enjoyed wearing my cloak. Our camp used to be all about staying up all night and sleeping late. However, somewhere along the way we dropped all the party people and turned into a chatty morning group. Poor Rich! He is the only one left who wants to sleep in and now he can’t because I talk too loud! One morning I got up at 6 am and walked around the neighborhood. It was the perfect time to look at other camps since no one was up yet. FYI: There are a lot of scroungy looking camps! Last year we made the mistake of leaving our sheet wall system at home. Every now and then we’d have some wandering idiot go through our camp because he/she couldn’t tell that the bridge was the entrance to OUR CAMP and NOT a public through-way. Determined to end it, we had my mom paint a new sign for over the bridge, put up lanterns and attached a rope to block the way (easily moved by those who are welcomed in). Some people may think we are overly cautious about “security”, but we’ve had many issues in the past. Once you get in though, it’s quite lovely. 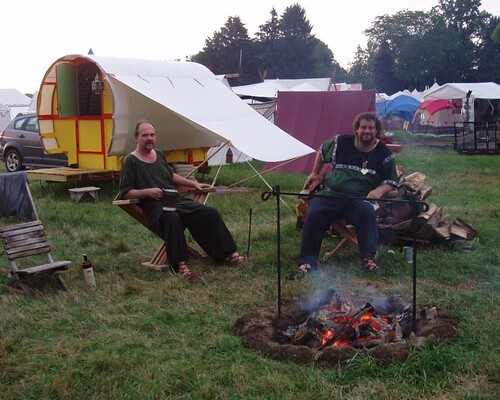 Pennsic is a great place to make friends, but sadly that means you are likely to see them only once a year. Such is the case with these ladies. We met when that little girl was 10 months old. Now she is six. Rich had taken this picture right after they came in and I hadn’t seen them in two years, so that explains the ridiculous Oprah face. 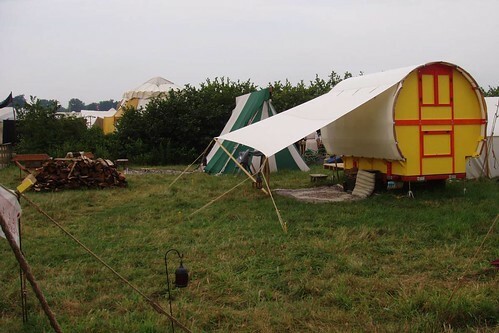 The camp has a front and back entrance. 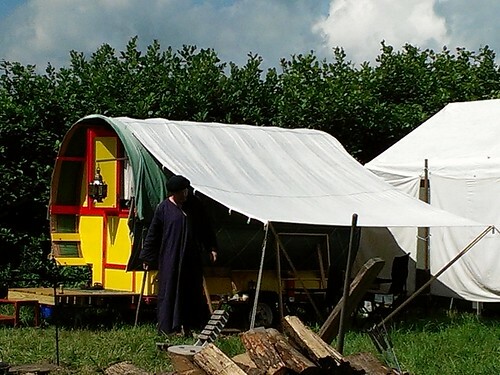 Our lovely hand-painted sheet wall panels go across the back since the front of the camp is covered in shrubbery. 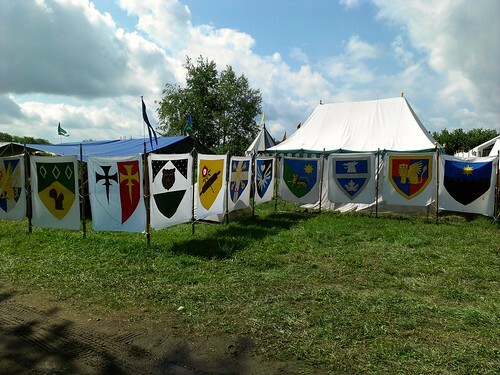 These are the heraldic representations of our household members. I am a squirrel. 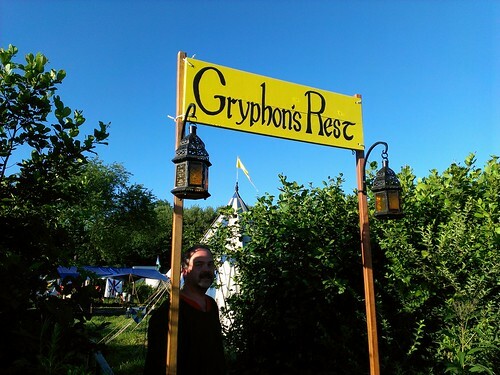 Richard is a gryphon. And that is a quick tour of our camp. I didn’t take any other pictures, not even of my camp mates. When you are there in the middle of it, it is hard to remember to get your camera out. Also, I was using the camera on my phone and then battery died.. sooo… anyway, we have a really great group. It really does feel like a funny little family with each person having their specific role. 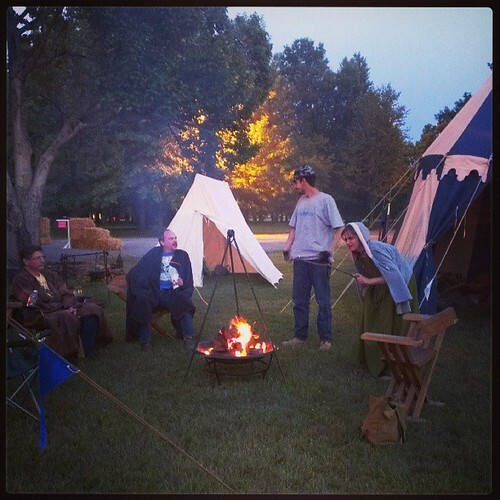 Hooray for Pennsic. Bringing weirdos together since 1972. 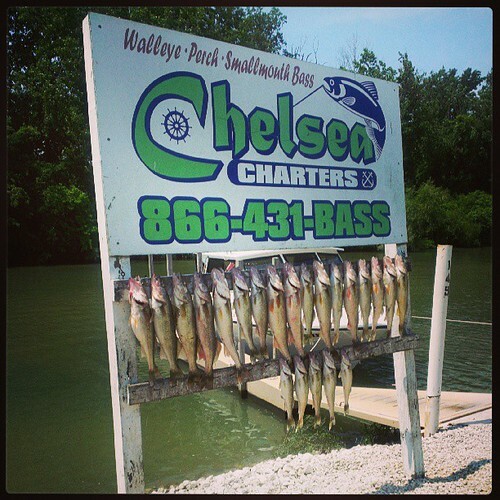 The family went on a fishing trip on Lake Erie. I hadn’t been in a boat for many years and it didn’t entirely agree with me. We did catch quite a few fish, so at least it wasn’t totally pointless. 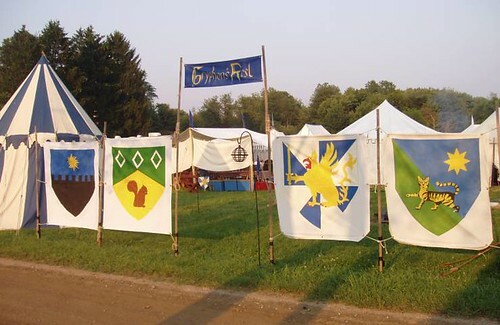 We helped run a Medieval Festival at the Christ Episcopal Church in Warren, OH. Rich and I stayed on site all weekend in our spectacular pavilion. 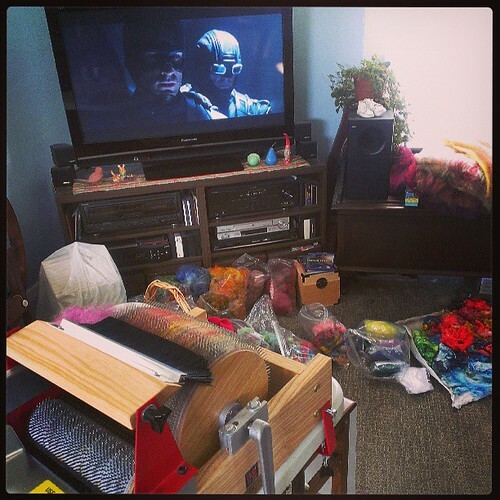 To get ready for Woolfest I spent several days with my new drumcarder, a heap of multicolored fibers, and a marathon of superhero movies. 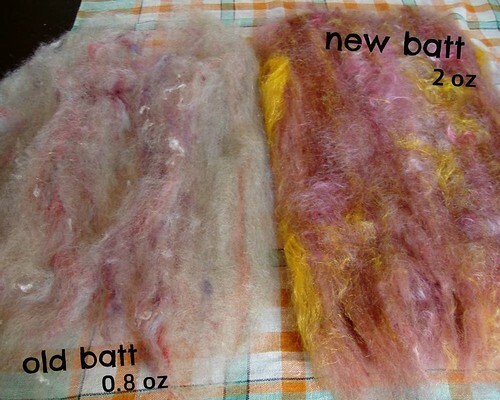 The new batts came out really great – thicker and more evenly carded. Rich and I went to Woolfest at the end of the month. It was really fun and I wore one of my new dresses. Summer of dresses is happening! 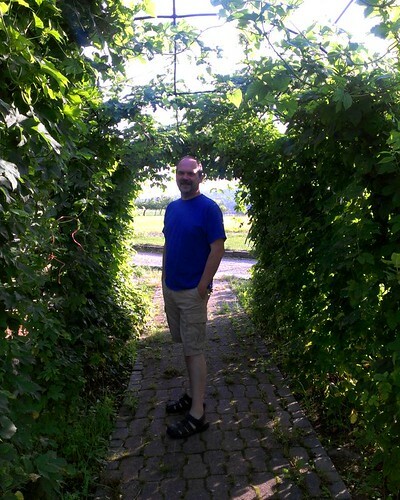 We walked around the beautiful Farmpark before the show started on Saturday and took a few pictures including this one of Rich in the arbor tunnel. this year it was the crickets. I am having a difficult time readjusting to “this” life after being Genevieve for a little while. 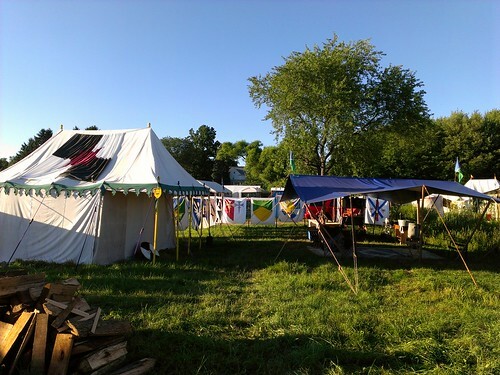 Being at Pennsic isn’t so much a vacation as it is a lifestyle. 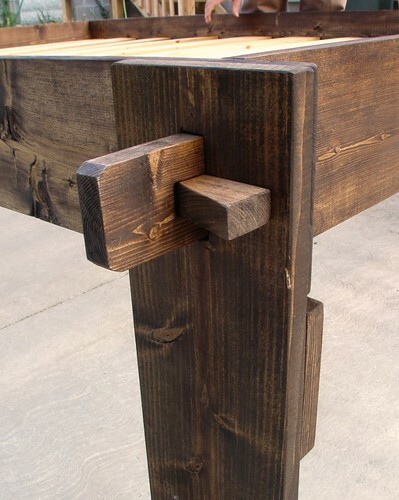 I can enjoy the outdoors without having to make special arrangements. I get exercise every day without having to make time for it in my schedule. I watch the moon travel across the sky each night. I sleep so much better. I don’t watch TV. Everything I need is right there. It’s so simple. My house feels alien. The yellow kitchen looks so bright. My bed is uncomfortable. I can’t see the sky. And of course I have to get back into my routine, whatever that is. Remember when I said I didn’t have anything planned for this year? Well, that was true, so when an opportunity to work at one of the merchant booths fell into my lap, I accepted. So from Wednesday of the first week to Friday of the second, I worked at Carolina Calicoes as a “fabric pixie” (that’s what one of the customers called me). Measuring, cutting, folding yards upon yards of linen. It was a great experience and the shop owners were wonderful to work with. At least it was something totally new and different! 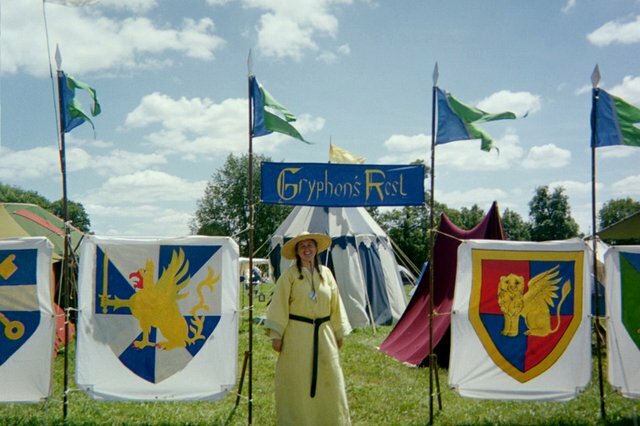 Since I’m away having a good time at Pennsic, I thought I’d share some memories from years gone by. After looking through Rich’s photo album, I realized that we don’t have any prints since 2005. So this year I decided to buy a disposable camera (with film). I will fill it up and drop it off at the drug store! Plus I’m planning to take the digital camera, although from looking at my Flickr photostream, it seems I’m not even very successful with that. 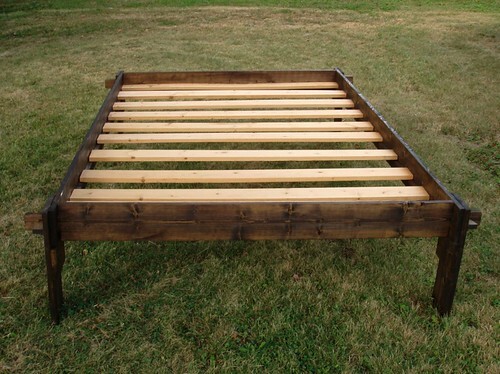 Rich decided we needed a new lighter bedframe to take to Pennsic this year. 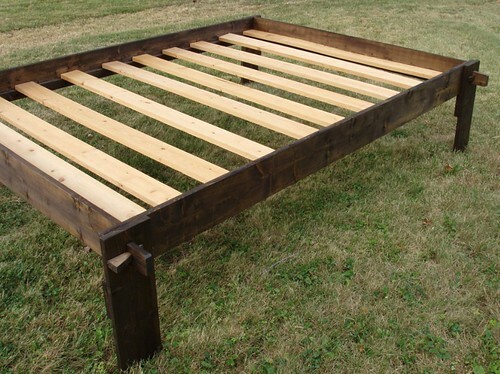 It fits a double mattress, or in our case, the futon mattress. And there is ample storage below for totes. We were able to fit all the pieces in one bag. And it goes together with these cute little wedges. Easy to put in, easy to take out, easy to tighten up. 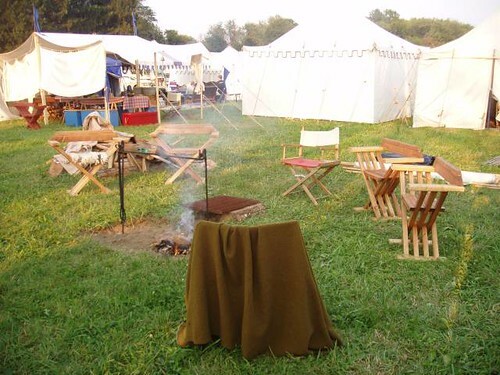 Another Pennsic has come and gone already. It was a quiet year, which is good for us. We have a history of foot burns, broken legs, bee stings, and spider bites. Ok, so all of those things only happened once each, but we do seem to be accident prone. I will claim the year’s medical issue in the form of a migraine that occurred on Saturday during pack up. But everyone and everything made it home just fine. 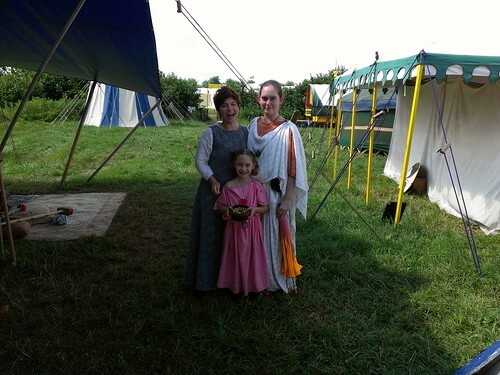 The fun parts of the week included visiting Pennsic-only friends (hi Lydia! 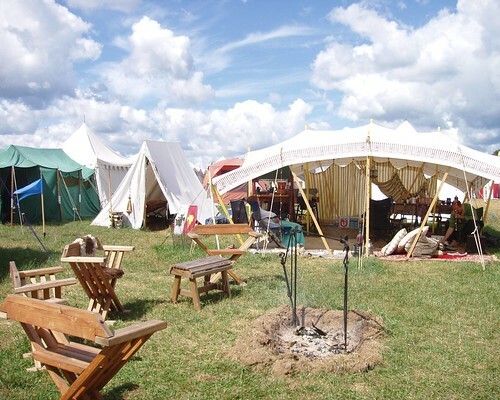 ); attending classes, such as cheesemaking, medieval spinning wheels, and becoming a merchant; drinking the best mead ever created; wandering the merchants; spending time with Rich; and lounging in camp. Also, I had a few items for sale at the Pine Knoll Herb Shop, so I spent a good deal of my time there. I brought all of the Romney yearling roving and scattered them amongst the soaps and herbs. 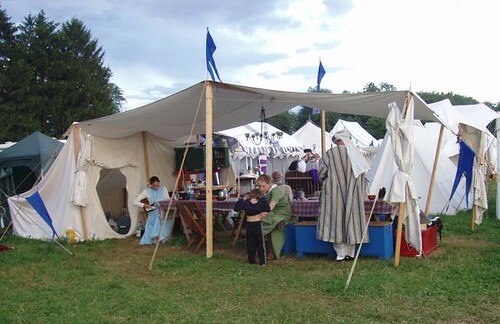 It was exciting to have people at Pennsic buying my stuff. 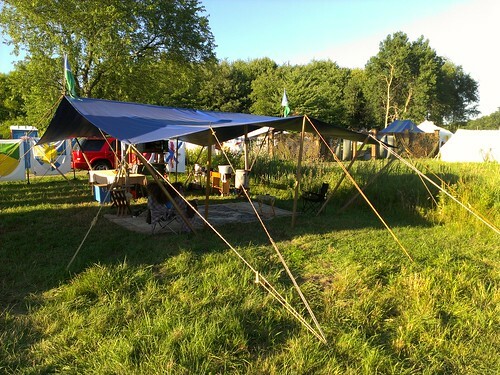 As requested by my sister, I did take a few pictures of the camp. There are a few more on my flickr photostream if you’re interested. Returned once again from War. Nothing much to report, although, considering our history (broken leg, burned foot, spider bite), that’s probably a good thing. Initially the weather was not good. Rain rain rain. Which turned into mud mud mud. Dark, gooey, and thick. Not to mention stinky. We decided to try out a new block this year and the end we wanted was the “flood” end. It didn’t flood, but we did have to dig a trench for drainage. It was so wet in fact, there were crayfish popping up in the middle of camp! I didn’t try to attend a lot of classes this year. There were a few that I really wanted to go to, but as with previous years, I made it to about half. 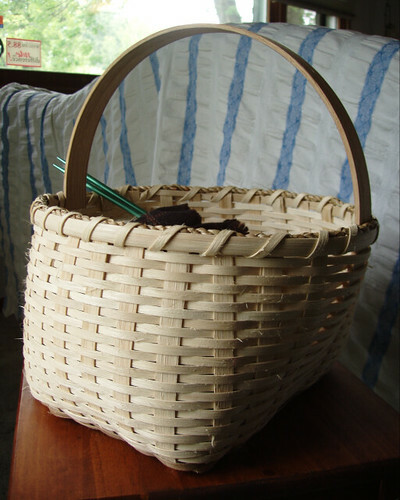 For the past three years, I’ve wanted to go to the basket-weaving class. First try, missed it, second try, missed it. This year, I finally got in, not without some drama, and made my first basket! It wasn’t really that difficult. Now I’m going to use the kits I got at Christmas to make more! Usually I’m not that great at budgeting myself, but this year I didn’t want to spend a lot of money. Luckily, I didn’t find a lot of expensive things I wanted, so I didn’t have a problem. I bought a mini nostepinne, fabric, spinning fiber, books, pottery, a brooch, a sock (yes, just one), and that’s it. I think. Overall it was a good year. Tuesday night I cut the two woolly seat cushions from the loom! 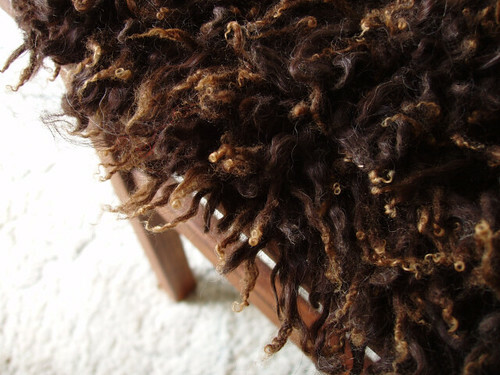 Yesterday I finished tying the fringe and securing the edges, although there are a few loose ends to sew in. I’m glad to have these off my plate, as the loom as been warped and waiting for months. Making Tuesdays weaving night was the best decision ever! I’m pleased with how they turned out, although the first one isn’t as dense as the second, meaning it might not be as squishy. I can’t say what the wool is that I used because it was unmarked when I bought it. Whatever it is, it doesn’t have a lot of lanolin in it. I thought the locks had been washed because they weren’t greasy, but after I had my hands on them for a few weeks (and gave them a sniff), I think they are actually dirty. Mostly they just seem dusty and stinky, so I’m going to wash both rugs before officially calling this project complete. 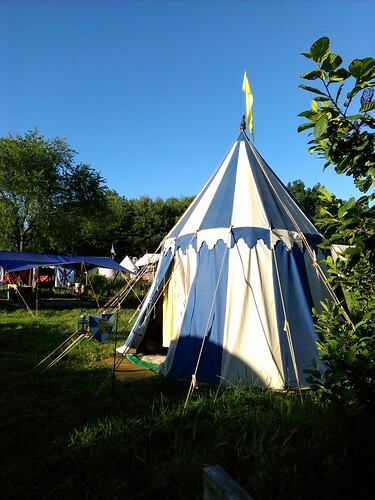 This weekend is the first BIG camping event of the summer. 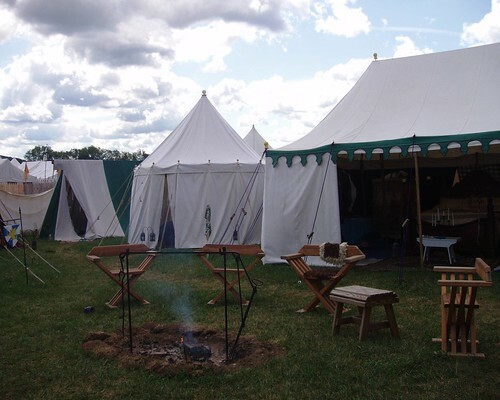 AETHELMEARC WAR PRACTICE at Cooper’s Lake, where we go for Pennsic War (hence “war practice”). Some of our household is going out tonight, but I have to work Friday morning, so I’ll be heading out in the afternoon. I’m bummed. I’m very curious about which merchants are going to be there. Will I come home with fiber? Fabric? Nothing? One never knows. 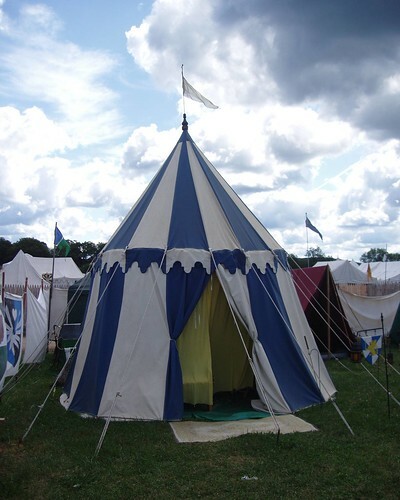 Luckily we had no problems returning from the 12th century to the 21st century. In past years it has been rather difficult and traumatic, but we managed it quite well this time. I’ve just been vegging out all day, although not everyone has that luxury. On my list of things to do: laundry. And if the sun cooperates, take photos of the goodies I brought home. A lot of them are packed away in the front of the truck, so it may be awhile. I took some photos of camp, although for those of you who don’t quite know what you are looking at, it may be confusing… I’ll just share a few; there are more on Flickr. Front gate of Gryphon’s Rest, our household. The sheetwall panels have our arms painted on them. Mine is the one on the left: green top, yellow bottom, squirrel. 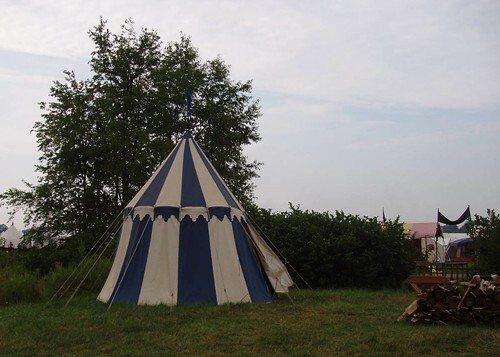 Most camps have some kind of entrance like this, displaying the name, with sheets for privacy and dust protection. Also keeps wanderers out of camp. 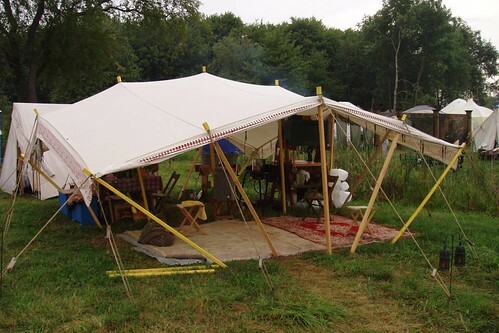 This is our lovely new dining fly, seen a few weeks ago at the demo. We had one long table down the center where we sat for dinner. The kitchen area was also under there, which was a little bit tight. Next year we’ll move the kitchen out and get shelves for the storage shed. 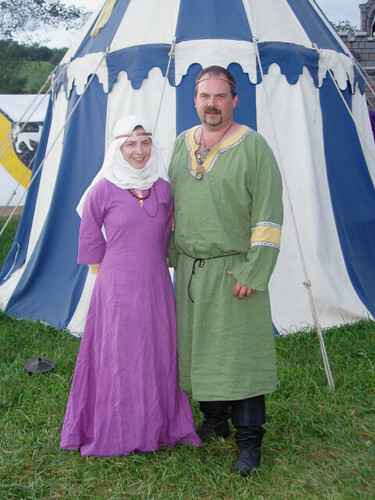 Here we are, Lady Genevieve and Lord Rickard, standing in front of his pavilion before leaving for Midrealm Court. We had just gotten circlets (which we have had the right to wear for several years and didn’t), so now we look semi-important. I have lots of sewing to do now that I’m home. Most of his tunics need to be taken in, especially in the sleeves. Apparently I didn’t measure very accurately when I made them. We had a good year. Rickard and I went dancing several nights, which was a great experience since in our home shire it’s really hard to get people to dance. I went to a few classes, some good, some lame. Mostly I get frustrated and give up because there are so many women trying to get in, they just elbow you right out. I didn’t do a whole lot of knitting or spinning, although I did buy a new spindle and some wool. I did a little bit of weaving and learned a new felting technique. It was good to get away and relax. We even had good weather. I almost forgot! Today is my 3 year anniversary of spinning! 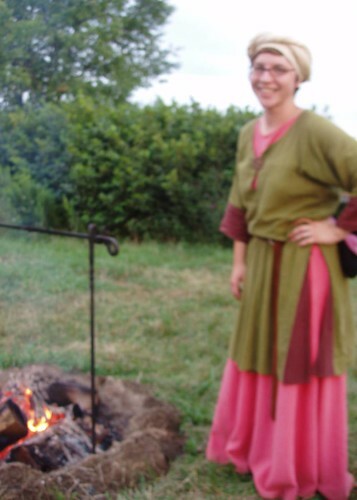 In 2005 I took the Turkish drop spindle class at Pennsic and here I am today. It’s really amazing what one little thing can do to change your life. For spinning, HOOBAH! So this is it everyone! 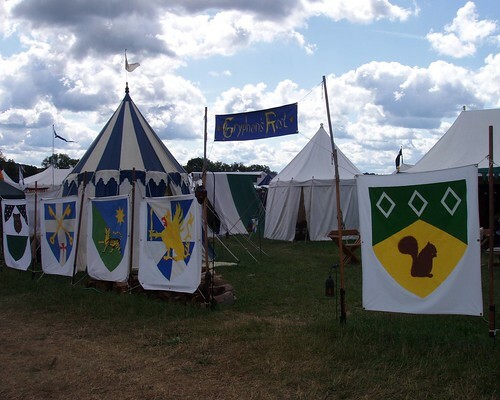 I am heading off to Pennsic tonight, the excitement starts tomorrow and lasts for two weeks! I hope you don’t forget about me while I’m gone and be sure to return the middle of August. Hopefully I will have some projects and purchases to share. A few things before I go. The Etsy Shop will be closed while I’m away. I’ll be putting all my items on hold so there aren’t any misunderstandings and lingering sales. 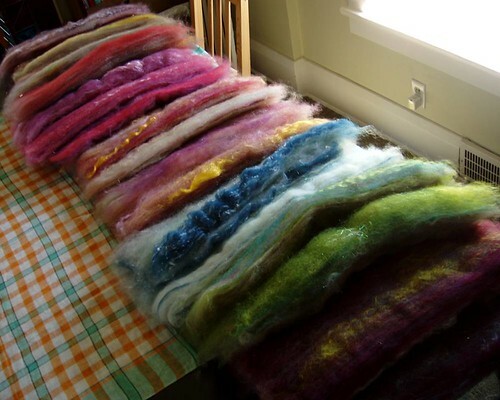 But as I mentioned a few days ago, I’ll be free from working when I get back, which means I should have *lots* of time for spinning and dyeing. Speaking of etsy sales, I want to share this photo that Marion left in my feedback. She bought the Surf and Turf, which was two separate colorways that she plied together. It is so beautiful! Thank you for sharing that Marion. 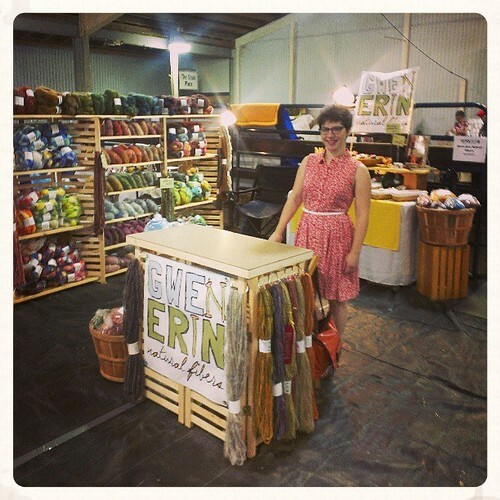 Also, Silja bought some roving quite early on and has posted pictures of it here. Thanks for posting! 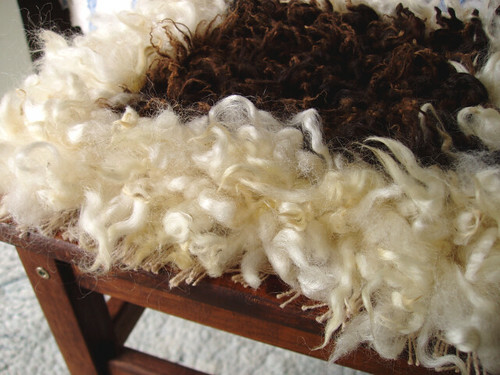 It’s very exciting to see what people are doing with my fibers. I get such a thrill. Hmm.. was there anything else I wanted to say? I suppose not! 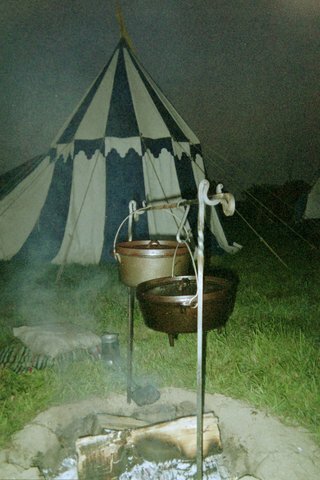 Anyway, I’ll leave you with a few old (and not so great) photos from Pennsic 35. We have none from 36, last year, because it was the year from hell. Endless bad weather, dreadful land negotiations, RVs, migraine, BROKEN LEG… the camp was a mess and there were no good photo opportunities, not to mention no one cared much. So, here’s to a good year!